Last night I signed my mom, my dad, my husband and I up for the Royal Family 5K the morning before my half marathon. I was able to talk my parents into running the race when they were out and I figured I'd sign us up before they changed their minds :). I mean, CHECK OUT THE AWESOME BLING?! How can you say 'no' to this SWEET medal?! My mom is not a runner, so I think I will hang back with her and do more of a walk/ run for this one - especially since the following morning I will be running 13.1 miles. I think it is going to be SUPER fun to do this all together (even though I doubt the boys will stick with us to finish). For princesses and their families, the Disney Royal Family 5K is a fun-filled way to start off this weekend's fairytale. 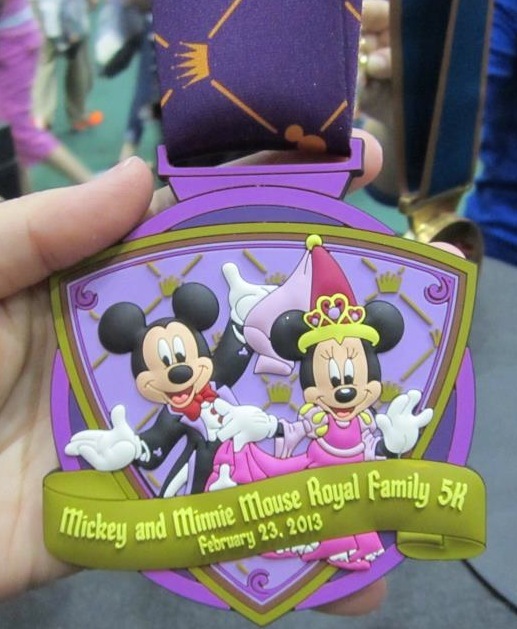 Run a 5K that the whole family can enjoy in this official Disney's Princess Half Marathon Weekend event. Adults, teens and tweens can experience a 5K course winding through Epcot® with a storybook ending! Its good that you convinced them and did well by signing them up for the marathon. I'm in love with the beautiful medal you have shared, its so awesome. Congrats on completing the marathon.